We are in the process of creating a brand new module for analysis and reporting. We would like to hear what kind of reports/charts/numbers you would like us to calculate! +1 for hourly billing rates! 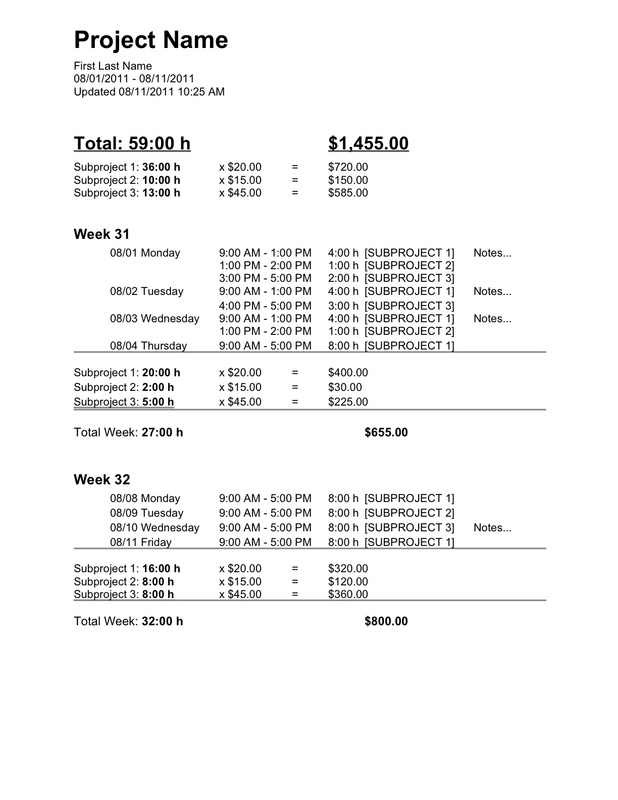 Also, a report that is chronological but still labels the projects, and then in the Weekly Totals and the Total break it up by project with the amount billed (from the billing rates). Multiply time by an hourly billing rate! 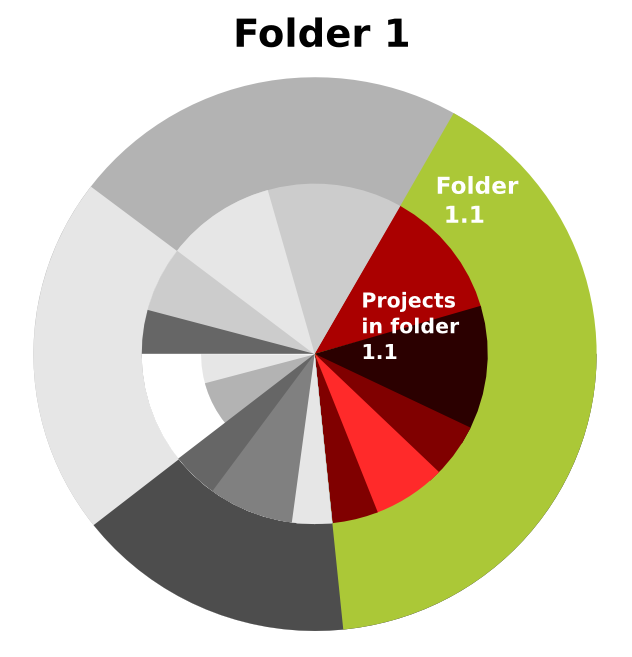 I'd like to have a pie chart telling me the percentage of time dedicated to different tasks (projects) within a folder and a specific time period. This way I can see which kind of tasks (yast projects) are taking more time in each project (yast folder), which projects are taking more time in the total working time, etc. 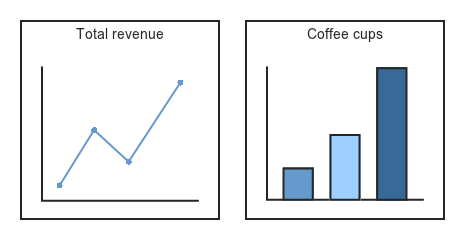 Hovering the graph could show details about every area. Clicking on each area could take to another graph where only the sub-folders/projects of that area would be shown. Currently, one can see a number of work hours per week in the top left corner (Week 10:30). However, when the new week begins this number is reset and a previous value is not saved anywhere. I would like to see a report that will show a total number of week work hours over several weeks. It will be good, if they could be additionally divided over projects. I have to report the time spent on all projects for every week. usually one creates such a report on monday or tuesday of next week. unfortunately (and obviously) at that time the week-summary column of the project list already shows the time of the current week ... even if you go back in time to former weeks (or days). result is that the (upper) time bars show the bars from previouse week/day but time summery in the lower projec tlist shows numbers for current week - not reflecting the bars above. change summery values to displayed time frame in bar-graphs or add such a column when going back in time. Would like to see a sub category for the project, where I can create a task for a particular project and see the reports based on the sub category (Example: Project: ClientXXX, Tasks: Documentation, Development, Testing, R&D). I would like see how much time I spent on Development (a billable task) and R&D (a non billable task) for the ClientXXX . I would like to track time spent on a project with different cost-rate. Sometime I can't charge travelling-hours (or perhaps 1/2 rate), and hours spent on projects I have overridden. Reporting totals based on top level folders with subprojects listed under them. I use the Folders for my "Clients" which can have several different projects within it. Yet I need to bill the client as a whole and not by the project. To have the sum of hours on each project per day! (Sometimes the timeline is alternating between two projects, but the only relevant number to report for me is the sum per project per day). I would like a total printout of all time spent on alle projects/activities in one year. This is needed in the Netherlands for taxation cuts, to show that I worked at least 1225 hours/year on my business. I would like to see you this application integrated with my google apps calendar. Meaning, if I have an appointment with a client set; after I am done with that appointment I would like to be able to add it to my yast time log by Yast giving me the option to pull from my google calendar. I'd like to be able to compare expected work time with the actual time spent. The Norwegian standard is 37,5 hrs per week, so I'd like to set a number (and override it when necessary), and see how I'm doing against that number. First, awesome product, and quick client feedback. Very impressed! Charts: I suppose they should be centred around the product value proposition, keep them in-line with strategic mission - (1) tracking time for billing, and (2) making user time more productive. 1. Time spent for billing: You have this already, a simple layout for feedback to clients with activities. This is all perfect for clients focused activities. Possibly just need some basic plots; what hours on what days. 1.1 - > Perhaps one potential here is somehow aggregating project descriptions that are exactly the same -> Which leads to using Tags instead of typing out project descriptions / or automatically displaying "recent descriptions". Save typing. 1.2 -> Then using this summed data, a non-chronological report, sum each identical description(tag) so present a pie chart of project time break down instead of current 100 identical fragments over 2 weeks in a text list. 2. Making More Productive: This is finding patterns in work style, time periods, goal setting, productive vs unproductive hours. This needs a concept of efficiency - having some projects(tags) be counted as unproductive. E.g. I have a sleep project, I want to see over time if I'm getting a regular 6-8 hours - but this isn't something you'd send to a client nor count as unproductive. 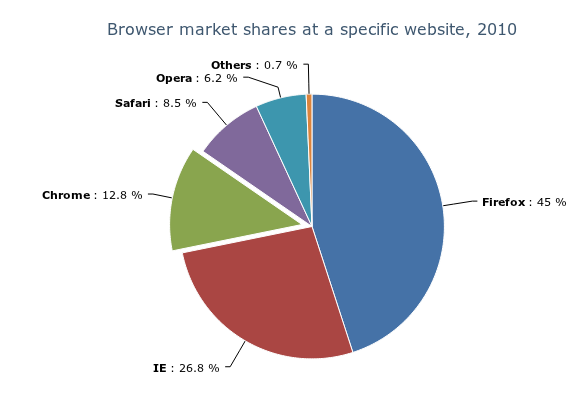 Perhaps a USP could be an aggregate pie chart, 0-24 hours - with time spent * frequency = weighting at this time period for this project; to give a good impression of the average day. It would help find repeat periods of poor productivity? Week view does a reasonable job at this as well. (3) Aimed efficiency, Aimed Billing Hours, Goals Reached, etc. (2) could use more brain storming, Im not sure! 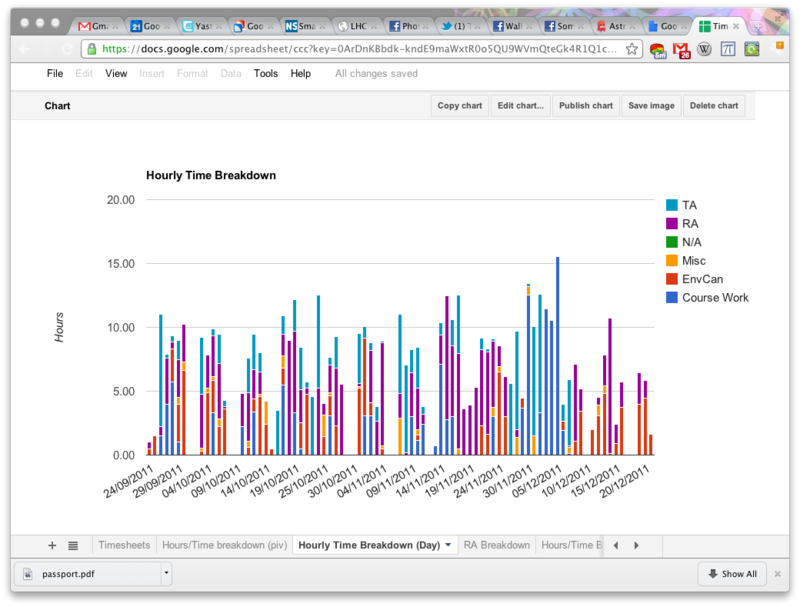 Productivity / tracking personal patterns is an emerging trend at the moment. Goodluck! How do you do it for the sleep project? Do you start the timer when you go to sleep? Drag it out in the morning :D. I only use YAST after the fact/work. This comment was removed on 2011-06-21. Hey! First, awesome product, and quick client feedback. Very impressed! Charts: I suppose they should be centred around the product value proposition, keep them in-line with strategic mission - (1) tracking time for billing, and (2) making user time more productive. 1. Time spent for billing: You have this already, a simple layout for feedback to clients with activities. This is all perfect for clients focused activities. Possibly just need some basic plots; what hours on what days. 1.1 - > Perhaps one potential here is somehow aggregating project descriptions that are exactly the same -> Which leads to using Tags instead of typing out project descriptions / or automatically displaying "recent descriptions". Save typing. 1.2 -> Then using this summed data, a non-chronological report, sum each identical description(tag) so present a pie chart of project time break down instead of current 100 identical fragments over 2 weeks in a text list. --- 2. Making More Productive: This is finding patterns in work style, time periods, goal setting, productive vs unproductive hours. This needs a concept of efficiency - having some projects(tags) be counted as unproductive. E.g. I have a sleep project, I want to see over time if I'm getting a regular 6-8 hours - but this isn't something you'd send to a client nor count as unproductive. RescueTime has a productivity factor which it compares you to other users to gauge efficiency, and compares you to the average user which is a nice motivation but has a poor time-input method. LetsFreckle has month view-daily pie-charts which (with difficulty) show pattens over time, Perhaps a USP could be an aggregate pie chart, 0-24 hours - with time spent * frequency = weighting at this time period for this project; to give a good impression of the average day. It would help find repeat periods of poor productivity? Week view does a reasonable job at this as well. (3) Aimed efficiency, Aimed Billing Hours, Goals Reached, etc. (2) could use more brain storming, Im not sure! 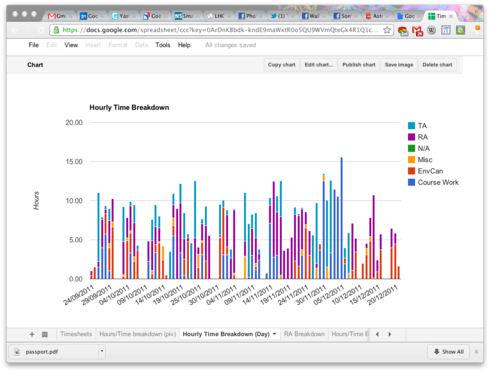 Productivity / tracking personal patterns is an emerging trend at the moment. Goodluck! I agree - I would also like to see total hours per day. I have the same issue!! i need to cover 180 hrs by month, so im only stop at lunch time. Yast works for me, but i need to make some adjustments to mi time line. And maybe the capability to see the reports on Android/iphone and the time line. This would be very useful to me. I have to fill my timesheet in on an hours-per-project-per-day basis and this is exactly what I need. I have only one simple request: To have the sum of hours on each project per day! (Sometimes the timeline is alternating between two projects, but the only relevant number to report for me is the sum per project per day). Yes, exactly. This would be a very useful feature. I would like to track time spent on a project with different cost-rate. Sometime I can't charge travelling-hours (or perhaps 1/2 rate), and hours spent on projects I have overridden. It would be nice to have a unique id available in the CSV/Excel report for each project/folder/subfolder, that would make it easier to automatically integrate against other systems. ABSOLUTELY!!! THIS IS A TREMENDOUS IDEA!!! This would make it a TON EASIER to make a report that will make sense to people other than yourself. A lot of times reports that you might make may only make sense to the person that did the report but having unique IDs would mean that people other than yourself, (i.e. a boss or co-worker) would be able to decipher what the reports are saying and be able to see how much time you spent on which task!! I actually use Yast like that, using "yast folders" as real projects and "yast projects" as tasks. So maybe it just needs renaming them. We are aware of that catch... :) And thanks Jorge for giving advice on how to build the hierarchy of the project structure. I agree that reporting by a M - F or M - S work week would be essential. I don't want to have to manually subtract hours I've already entered in the following week. I would like to remeber here to my posted idea/suggestion (http://support.yast.com/yast/topics/show_project_hours_if_a_previous_weeks_day_is_selected) I have to report the time spent on all projects for every week. usually one creates such a report on monday or tuesday of next week. unfortunately (and obviously) at that time the week-summary column of the project list already shows the time of the current week ... even if you go back in time to former weeks (or days). result is that the (upper) time bars show the bars from previouse week/day but time summery in the lower projec tlist shows numbers for current week - not reflecting the bars above. change summery values to displayed time frame in bar-graphs or add such a column when going back in time. i would like to be able to make comments each time i do an assignment which will be saved so i can micromanage/keep track of exactly what i did on each project at that given moment. In another way then what is available now? I COULDN'T AGREE MORE!!! GREAT IDEA!!! I love this kind of feedback! In general, mock ups are great to look at for inspiration. If you have more, let us know! This is a great idea!! Especially with the current state of the economy, every business (most especially the small "Mom & Pop" businesses) needs to bill it's customers for every second of time that they spend working on a project for that client. If the only way that the Billing Department can see how much time every employee logs for every client, is for each individual employee to "share" their Yast projects w/ the billing department, then there is a tremendous possibility for lost revenue!! If the employee(s) would accidentally forget to click the "Share" button then the client wouldn't get billed for the work and the company would lose out on the revenue, since they would have, in essence giving away their employee's time & talents!! I very much appreciate your asking this question, and I appreciate your continuing interest in user feedback. I would like to create a way for my clients to have "read-only" access to dynamic reports on what I am doing for them. Could I create a shadow account for Client A, who could view (but not edit or overwrite) my data on projects for Client A? Separately, Client B could view (but not edit or overwrite) my data on my work for Client A? (I know this is a feature request somewhat outside the idea of "charts I'd like," but it's the feature I'd most like on Yast, which is a great app!) I'd also like to +1 for the integration with Google Calendar and +1 for showing total time on projects at day's end. Finally, can Yast be exported into QuickBooks? From the discussions above, I can see that we are on the right track with our work. We are building some new functionality as well to be able to build the reports requested here, and on top of that, we have to make it look good without cluttering the interface. I will not say or reveal exactly how our interaction design looks right now (in case we have to withdraw something again), but can tell you that the view in, "settings", "sharing" and "report" will be modified to the better. Any ETA on the next update? Hi everybody, Thanks for great feedback. From the discussions above, I can see that we are on the right track with our work. We are building some new functionality as well to be able to build the reports requested here, and on top of that, we have to make it look good without cluttering the interface. I will not say or reveal exactly how our interaction design looks right now (in case we have to withdraw something again), but can tell you that the view in, "settings", "sharing" and "report" will be modified to the better. better reporting across projects and staff and groups. Really love this product, and use it (literally) non stop. It's awesome for time management. It's probably more of a feature than a report per-se. I'd imagine a 'billed' check box option where I can tick off the time as billed (and perhaps change it's color) and more the time record into archives or something.. then reset the timer until next billing cycle. I'm not sure I quite follow what you're referring to when you say "and more the time record into archives or something.. then reset the timer until next billing cycle." What do you you mean by "more the time record into archives"
Why would you "reset the timer until the next billing cycle"? I'm using this track my consulting time and precisely bill my clients for my time. I often need to bill a client for my time, multiple times during a project. So I'm looking to have a report that shows ONLY my 'unbilled' time so I can easily keep track of what has been entered into my accounting software. means that after I click 'billed' next to that individual project, the timer on that project would show 0 from this point on in all reports (unless I check 'show billed time'), and any new time put in would start from there. This would repeat each time I decided to 'bill the client'. 2) When a project is completed, but I dont want to delete it, I would like to 'hide' or 'archive it'. (I currently do this manually). Archives would mean when I have finished (and billed) and project, I could click archive to move the project to a completely separate 'tab/category', so my main view and report would not only show 'unbilled', it would also show only my 'active' projects.... This would also remove old/stale projects from all default reports so they don't get cluttered. a means that when I add up the time and send the bill the to the client, I need to enter something at that point to know that the new time I am adding is for a new bill. Thanks for pointing out your needs so clearly. It is a very good feature request, and you ́re not alone. Internally, we need it badly so we ́re going to do something here. 1. Add a "billed"/"invoiced" (what is correct english here?) tag you can add to time records when you do reports. Meaning, you can filter your hours by billed and unbilled hours. By doing it this way, the report will exclude "billed" time, and only count the unbilled hours. Then if you bill the hours, they are taged as "billed", and the next time you filter by "unbilled", the report will only include your latest time records and work as if you reset the timer. 2. We are aware of this, and will do something about this issue. Probably, but not certainly, solve it by "hide project". Archiving may have some unwanted effects in shared projects, so "hiding" is so far the best solution. Thanks! I have a programming background, so that kinda helps. Billed is more US English, and Invoiced is more UK English. Either are fine. 1. I don't think a tag will work so well, because that would refer to the entire time-record, whereas I think people would need to 'split' the same time record. 3) recreate the recreate from scratch. 2. Hiding option is great. That would work perfectly as long it 'remains assigned to the same folder it was in. 1. Don ́t think I totally understand the "split" here. Could you describe a situation where people would have to split the same time record? 2. Yes, that is the idea. It has to stay in its folder, while archiving may imply to somebody that you move it from one folder to the "archive"-folder. It would mess up the reports. Let's say I'm redoing someone's branding and charging per hour. I will be sending the client bills at the end of the month. So for the first month I work 12.5 hours, then I wait a week for his changes and the second month I work 18 hours. I need to send a bill at 12.5 and at 18. So at the end of the second month, I would not want to see 30.5 hours on that record, I would want to see 18 unbilled on that record, because 12.5 is already billed. Keep in mind that I might work 2 hours this morning, then bill, then work 3 hours in the afternoon. Currently, I need to create a new project every time I bill! PS. Total time spent on a project is great for people paid per project. For freelancers and hourly billlers, the total time on a project is not important. What is important is how many hours can I bill for right now. (although it's nice to know total per project as a bonus). Hope this is clear now. Really love this product, and use it (literally) non stop. It's awesome for time management. I'm desperate for a report that would allow me to see unbilled and billed time.... It's probably more of a feature than a report per-se. I'd imagine a 'billed' check box option where I can tick off the time as billed (and perhaps change it's color) and more the time record into archives or something.. then reset the timer until next billing cycle. Awesome tool, I really like it a lot!!! There is one report that would be very useful for me. I'd like to see values that are "negative hours" compared to a weekly working time. Annually/monthly overtime/under-time (is that what it's called?) statistics to monitor my work hours. Most awesome would be a relation to a "location" related public-holiday list plus vacations etc. So I could tell exactly how much over-/under-time I already made this year/month. What exactly is a "negative hour"?? Planning on implementing "budgeted hours for this project". Meaning, you can assign a certain number of hours to a project, and then see if you work more or less hours than what is expected for that project. Have not figured if we ́re going to set it on an individual level yet, meaning that you can set an expected hours pr employee. If I have a 40 hour week and only work 38 hours I have 2 negative hours. Integration with iCal on the Mac would be very nice. ABSOLUTELY!! As a life-long Mac Addict, this would be a TREMENDOUS ADDITION!! Honestly, I find it quite horrible & frustrating that the large majority of the business world are completely & totally dependent on PCs (or as I call them... PAPERWEIGHT CONTRAPTIONS)!!! If you ask me that is what the abbreviation actually stands for!! I'd love if I could integrate with iCal or iProcrastinate (a great to-do app for mac). Also, I'd love to see weekly totals excluding one or two folders/projects. I'd love if I could integrate with iCal or iProcrastinate (a great to-do app for mac). Also, I'd love to see weekly totals excluding one or two folders/projects. I am really looking forward to seeing what kind of AWESOME changes that you will be making to the Yast User Interface. When might we expect to see the new interface debut?? We would love to be able to produce a report that showed a timeline of the day, with the time in one column, the project in another column, and then finally any notes. We're aiming for an overview of the day, and how we moved from project to project. We want to see whether we're making an efficient use of time, and maybe focusing too much on certain projects in the day, and a single view of the whole day and the projects would help. We would love to be able to produce a report that showed a timeline of the day, with the time in one column, the project in another column, and then finally any notes. Currently we cannot do this and only have two real choices: - Show a timeline of the day with just the description of what we did (what project we were working on doesn't show - A breakdown by project and then time (not a whole day) We're aiming for an overview of the day, and how we moved from project to project. We want to see whether we're making an efficient use of time, and maybe focusing too much on certain projects in the day, and a single view of the whole day and the projects would help. The ability to view time in decimal form would be great. I send my clients the pdf report as a bill and they continually pay me for .3 hours instead of .5 hours. They are not use to this format and as many times as I tell them, they will continue to make this mistake. Good point, and probably the best story we ́ve heard of why this is dealbreaking important. Yes, it would be great to see a summary report over a specified period of time that can be sent to a client or kept for administrative purposes. It should simply list all the projects with the amount of time spent working on the project during that period of time. For the tax I have cut their hours I worked, not exactly. But in the past. Roughly throw it. Would that be possible? Could you clarify what you mean by that Hertog? set easy in the past my hours. Week 2 and 3 I had 80 hours working on that project. From date... till date ... (8 hours a day). For the tax I have cut their hours I worked, not exactly. But in the past. Roughly throw it. Would that be possible? I would like to create programmed tasks. What I mean by that is that it would be nice to click on a button that creates a new task. The task always has the same sub tasks, but is a new task per client. It would be used for sales or other client interactions so you can do the same things with each client and then learn how long it takes to get to each step and where people fall out or where projects have a bottle neck. This reply was removed on 2011-07-09. I would like to add my vote for the ability to assign an hourly billing rate on a per project basis. Generally I'm still trialling yast and am quite happy so far - the addition of an hourly rate would be a real bonus however. To be able to assign a project to default billable or unbillable would be helpful, too, instead of having to edit individual time entries to make every one billable. oh, yes, reports grouped according to folder+project structure, including subtotals on each level, and full path name displayed. And reports per day. Thanks! oh, yes, reports grouped according to folder+project structure, including subtotals on each level, and full path name displayed. And reports per day. Thanks! Organise the projects alphabetically automatically, saves me doing it! Apart from that, I love it! I would like to see an option to send the report automatically to my employer. Just so I don't need to download the PDF and then send the email myself. Great product. I would like to see an option to send the report automatically to my employer. Just so I don't need to download the PDF and then send the email myself. I'd like to be able to group by date when running reports, so that I can see my totals for each day of the week. It's simple, but it's communicates a lot. I'd like to be able to see daily sums, and folder level sums. Right now I import all the entries into a Google Spreadsheet (use the API to download the entries and format them into a CSV form I can copy and past into Google Spreadsheets.) Right now I have a bunch of pivot tables then sorting the data so I can plot it, but essentially, this is the results: Daily Sum broken down by folder: <a href="https://s3.amazonaws.com/satisfaction-production/s3_images/659133/dailysum.png"><img src="https://s3.amazonaws.com/satisfaction-production/s3_images/659133/dailysum_inline.png" alt="Daily sum broken down by folder" /></a>Daily sum broken down by sub-folder: <a href="https://s3.amazonaws.com/satisfaction-production/s3_images/659137/subfolder_breakdown.png"><img src="https://s3.amazonaws.com/satisfaction-production/s3_images/659137/subfolder_breakdown_inline.png" alt="Daily sum broken down by sub folder" /></a>It's simple, but it's communicates a lot. I would like to see time grouped by folder in the reports, and broken down by sub project, and a way to sort it all. I'd love to see this update, or any update. Can you let us know what's going on? They claim they are thinking about it. They've been thinking for over 7 months now. I guess they're not the brightest bunch. 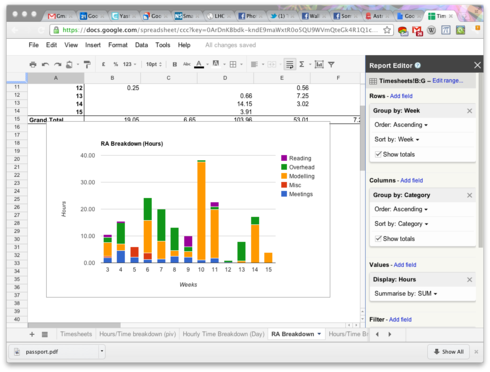 I would like to see time grouped by folder in the reports, and broken down by sub project, and a way to sort it all. I'd love to see this update, or any update. Can you let us know what's going on? Thanks. option for group by day then project (currently only options for group by project or group by week then project). I also want an easy way to see daily totals. To me a nice online presentation of the selected data is very important. I just opened another thread before i found this one and i am very happy, that you will improve the reports section. Sum of each project, for each day of the week. I see csv reporting is now available to non-Premium users...is this going to stay this way or should I expect it to disappear sometime soon? If you take a look at rescue time.com they have seriously polished data visualization scheme im sure you could benefit from taking a look. Yast is a very cool web app that the studio I work for would really like to begin using only it's missing some things in the reports that makes the principal here unwilling to implement. It is however possible that Yast has these features but we are unaware of them. We're interested in generating a report for a job that would include everyone in the company's time, broken down per employee in a table with the descriptions they typed in and the hours with a sum for each employee. Secondly, we were interested in seeing reports for daily summaries that again break down by employee, the entirety of the employee's day with descriptions. The UI on Yast is great and simple but we feel that the reports are lackluster with a lot of unhelpful charts. We feel there is so much more potential to utilize with the information inputted into Yast. Yast is a very cool web app that the studio I work for would really like to begin using only it's missing some things in the reports that makes the principal here unwilling to implement. It is however possible that Yast has these features but we are unaware of them. We're interested in generating a report for a job that would include everyone in the company's time, broken down per employee in a table with the descriptions they typed in and the hours with a sum for each employee. Secondly, we were interested in seeing reports for daily summaries that again break down by employee, the entirety of the employee's day with descriptions. The UI on Yast is great and simple but we feel that the reports are lackluster with a lot of unhelpful charts. We feel there is so much more potential to utilize with the information inputted into Yast. Am I not able to export any data with the free edition? I see all of my data on the screen but every time I click one of the export options I'm asked to upgrade to a "business" account. Yes, that is correct. Downloadable reports (including "new window") are a part of the Yast Business package. Many of my projects are on-going, and I bill them in irregular intervals. I would like to be able to set a "billing point" in the timeline, and have automated reports based on that (e.g. additional selection in the time period selector: since last billing).